California’s homeownership rate averaged 55.2% in 2018. This continues the slight upward trend experienced during 2016-2018, but remains far below the 2006 peak, which was a high 60.7%. Expect California’s homeownership rate to remain around 55% for the next decade. Fewer homeowners means more renters. Is rental construction rising to meet today’s growing renter population? Not quickly enough — the state’s rental vacancy rate also remains low, averaging 4.4% in 2018. While higher than the recent low experienced in 2016, this is below the historical equilibrium of 5.5%. 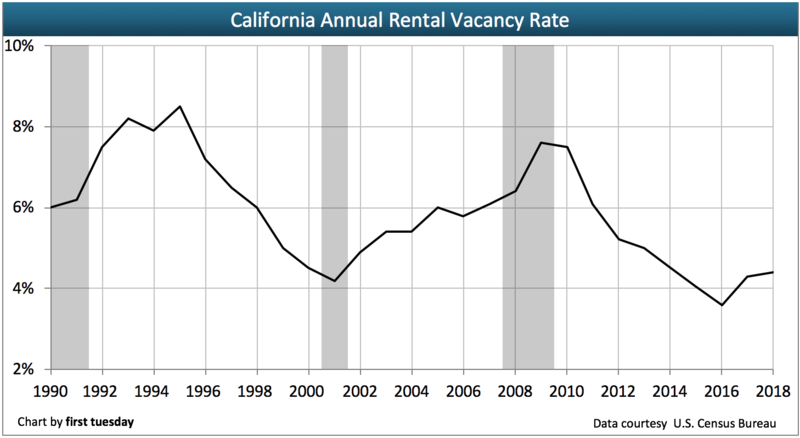 The low rental vacancy rate has contributed to quickly rising rents across the state. If the rent jump is going to end soon, multi-family construction needs to rise to meet demand. Updated February 28, 2019. Original copy posted July 2010. California’s homeownership rate is historically around 10 percentage points below the national homeownership rate (at 65% at the end of 2018). This is due to a combination of factors; including the lesser impact the national policy of pushing the “American Dream” of homeownership has had on more mobile, free-spirited Californians. California’s rate of homeownership has declined dramatically since the 2008 recession, a full six percentage point drop since its peak year of 2006. In a non-recession market, homeownership rates drop as interest rates move upward to cool the economy, as reflected in the rate of homeownership during the late 1950s through the early 1980s. Chart 1 displays the generally unacknowledged converse relationship between the average 30-year mortgage rate and the homeownership rate (and home price trends) from early 1980 until 2006, when the upward ride of the Millennium Boom began to reverse course. However, due to our bumpy plateau recovery brought on by the financial crisis, after 2007 both mortgage and homeownership rates have dropped in tandem. Today, the homeownership rate is mostly stable, at around 54%, a correction of the effects of irresponsible lending during the Millennium Boom (not the fault of FHA, Fannie Mae or Freddie Mac, but Wall Street bond market independence). Further, the Federal Reserve (the Fed) kept interest rates low the past several years to coax homebuyers out of the woodwork (since Congress has failed to do so) by continuing to supply money to mortgage lenders at literally zero interest. However, in late 2016 the 30-year mortgage rate began to rise, as it did in the ‘60s and ‘70s, and with that move, the homeownership rate will continue to lose strength before it fully stabilizes. California’s homeownership rate demonstrated an upward trend from the 1970s until peaking in 2006. This long-term increase and the following crash were due to a variety of economic factors. During the past 30 years, interest rates were in a continual state of decline, reaching their all-time low today. Over the next 25 years or so, interest rates will rise, inhibiting homeownership growth. As demonstrated in Chart 1, the Fed intentionally raises short-term interest rates to induce a business recession when the economy is over-performing. The effects usually take hold in two to three years. More precisely, the recession sets in around 12 months after short-term rates rise above long-term rates. This cyclical action has occurred periodically since WWII, until the early 2000s, when the Fed skipped the second phase of this action due to the events of September 11. Just as the recession’s magic was removing inefficiencies in the economy, fiscal and monetary moves post-9/11 led directly to the Millennium Boom. In the boom, as aided and abetted by financial deregulation, low-tier home prices were artificially driven to a three-fold high. A new real estate paradigm was prematurely declared in which prices would go up and up forever, in defiance of economic principles. Bond rating agencies, properly induced by Wall Street Bankers, fully endorsed the concept. Of course, this false paradigm came crashing down in 2007, which resulted in the most significant U.S. recession since the Great Depression. While California finally returned to pre-recession job numbers at the end of 2014, enough jobs have yet to be created to keep up with the intervening population increase of working-age individuals. It will take until about 2019 to reach the percentage of California’s population employed in 2007, since we experienced a nearly 10% population increase from 2007 through 2016. This factor will be to the single family residence (SFR) builders’ delight. Apart from the effects of various economic factors, the evolving societal mores of the younger generation (Generation Y (Gen Y)) show an increasing tendency towards renting, rather than owning, one’s shelter. In lieu of homeownership, potential homebuyers will take advantage of their only other option: renting. Often they will occupy detached SFRs, currently the playground for ownership among many industrious buy-to-let investors. The rental activity of would-be homeowners forced to be tenants will be one of the driving forces increasing rental occupancy rates for the short term. City councils, however, will not likely permit the construction of high-rise, high-density multi-family units required to keep rents stable. Without proper zoning, rents will increase enough to cause a shift in housing preference to homeownership of SFRs. Then it will be back to suburban sprawl all over again. 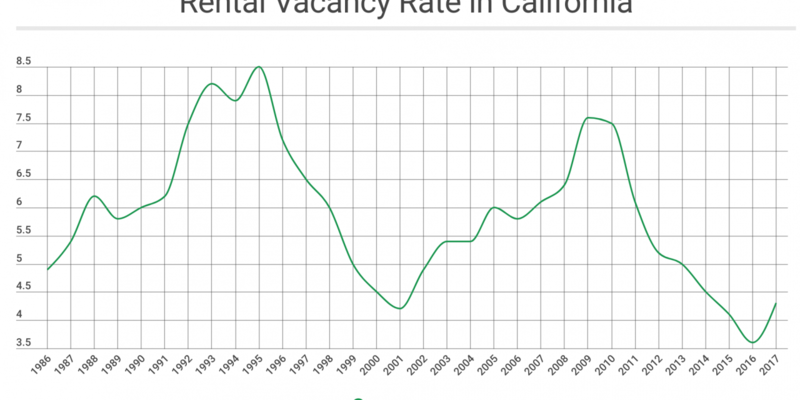 Logic dictates that any large decrease in California homeownership should lead to a correspondingly large increase in demand for rental housing. But the builder response to this demand has been held back to a combination of difficulty securing credit and strict zoning regulations limiting density. Multi-family construction in 2017 was roughly level with 2015, with a sharp dip in between during 2016. As the growing occupancy-aged population combines with the nascent job-market recovery, the potential demand we see will be realized, producing a sharp rebound in the builders’ market for apartments. For the moment, however, rental housing is not scarce, particularly in the inland communities. No reason exists to expect any overall scarcity within two or three years. Are rentals a passing trend, or a permanent change? 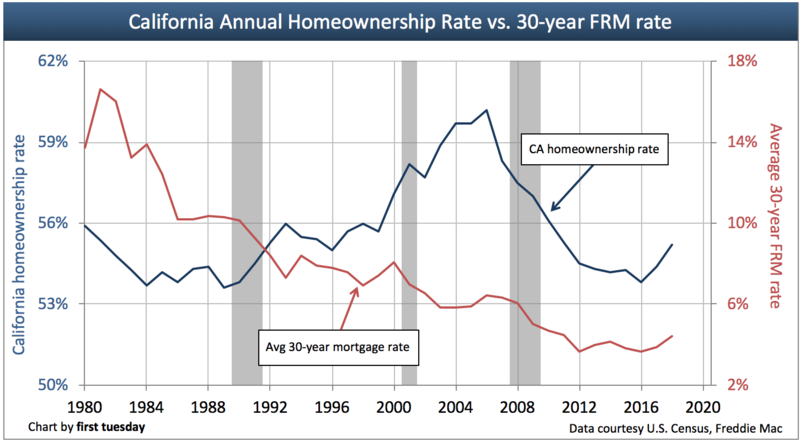 A long time remains before homeownership levels hit bottom in California, and homeownership will not begin any measureable resurgence from that bottom level until at least 2018. In this decade, rental property will become the new standard; the only alternative to traditional homeownership (with the rare exceptions of homelessness, motor homes, boats and cars). Less risky than traditional homeownership, renting is poised to fill the gap left by foreclosure for families who will need to relocate. Many families hit with foreclosure are now unable to qualify for a purchase-assist mortgage to buy another home, and many more are simply disillusioned with the financial facts of homeownership. Once burned, they are hesitant to put themselves back into what they now perceive as a combustible situation. But are rentals the wave of the future, or will the population and the government return to pushing single family homeownership when pocketbooks and anxieties finish recovering from the worst of the recession’s pain? 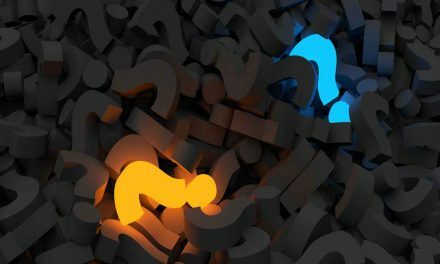 The answers will not be determined by current or former homeowners, but by the large new generation of potential homebuyers in Gen Y who are just beginning to come of age. In the immediate future, first tuesday forecasts that the population will become increasingly centered in the cities, where jobs, culture and personal conveniences are ready at hand. 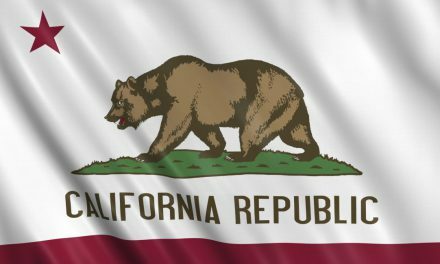 California, which has always had a homeownership rate roughly 10% lower than the nation as a whole, will be especially susceptible to this trend. For a mobile, contemporary and more youthful population like California’s, rentals will more often be the natural choice. I live in Lodi just a few miles from Stockton. Stockton has been hurt big time with homes built between 2003 to 2008 showing 60 to 80 % lost to forclosures. Most of these homes were sold to owner occupied families uisng ARM loans with pick your payments that would give negative loan reductions or growing loan amounts due to added unpaid interest to the loan each month. Values in Stockton are still going down. For the first time in a long time we have 2 and 3 families pulling together to rent or buy homes. Rents are also going down in Stockton. All the money given by Government has not changed this.The same Banks that got money from the Government are not working to help the buyers who used good loans to purchase their home but are now paying the price for the Bank Loans that were pushed on most buyers during this time that did not really understand what a pick a loan payment was all about. I can not believe anyone would use this loan product if the loan product was really explained to the borrower in the first place. From what I hear from friends in California, the housing seems to have stabilized already. New homes in desirable cities and towns are once again being snapped up fast. Same is the case with distressed homes even in the bubble-bust cities and towns. Multiple offers is the order of the day. Low interest rates definitely seems to have had a positive effect on housing. Jumbo loans that had become extinct, have reportedly made a comeback. Hopefully, with the new regulations, we don’t go back to the 2004 – 2006 style irrational exuberance!! I read your article with great interest since Property Management is our core business – and the majority of our managed properties are single family homes or condos/townhomes. H.M.S. has been around since the early 70’s so it has seen the rental market up’s and down’s – which used to follow a seven year cycle. I agree that all the foreclosures have not increased substantially the demand for rental housing. As your article points out, these families are moving in with family or leaving for other states where there are jobs and housing that is more affordable. Very interesting that you see rentals as a move for the future — especially with Generation ‘Y’ — that is a very good point. We still find that having a rental that is clean, updated, and priced at market will rent. Landlords that have a poor image of renters and don’t fix up their properties are having their investments sit empty. Pointing out that the renters of today include professionals, teachers, white & blue collar workers is important. Over the years, we have found that over 95% of the tenants leave the property in a condition that it can be rented out again with minor work. Right-on about not needing more apartments built at this time! 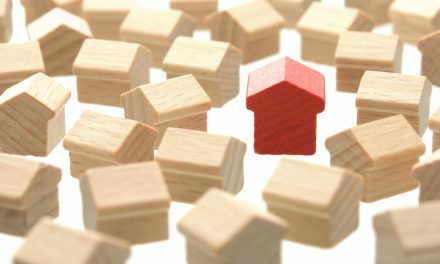 Hmmm – when you discuss Section 8 housing — did you know that Section 8 policy is different depending on the county? Some counties in California have frozen rents for the last 2 years. In addition, some have not taken applications to get on the waiting list for the last 2 years; nor added anyone to the program. As in other government programs, HUD has had to cut costs as well. I have not researched government financing for Section 8 landlord upgrades to improvements; but I haven’t seen these being available either in the last couple of years. We, in property management, are beginning to look at what landlords can do to be more energy efficient – i.e. replacing old appliances/furnaces with Energy Efficient ones. Anyway, thanks so much for the informative article — looking forward to 2012 and a better economy! What is the cause of this? The current administration in the White House and their belief that more government spending along with HIGHER TAXES will stimulate the economy! However, the opposite is true. As an example, we only have to look to the GREAT DEPRESSION and how President Roosevelt passed the HIGHEST TAX INCREASE in U.S. History at that point and unemployment went from 15% from President Hoover and the STOCK MARKET CRASH of 1929 to 25% in1933 once the ROOSEVELT TAX INCREASE WAS PASSED! The same thing will happen next year! More and more economists are predicting that the United States is about to enter a DEPRESSION, one of which this country has never seen or felt because this time it will be more global than the last one. Remember, the President said that if the stimulus bill was not passed that we would see unemployment above 8%. My question is, now that the stimulus has been passed, why is the unemployment rate above 8%?